William Durrant is responsible for the Chevy bowtie logo. As the story goes in 1908 while visiting France he was drawn to the design on the wallpaper in his room. The wallpaper’s bowtie pattern marched off into infinity. He liked it so much remove the sample wallpaper and brought home the show’s friends. He thought this would make a great local for his new Chevrolet car company. William Durrant chose the name Chevrolet because he found the name musical and like the romance of its foreign origin. At the time, racecar drivers were seen as public heroes and naming a car company after one could not hurt. Chevrolet began in a small shop on Grand River Avenue in Detroit Michigan. A small group work to assemble a five passenger touring car may and the classic six. 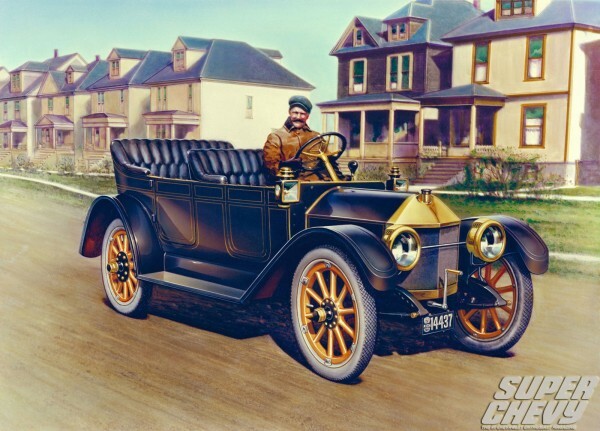 The car’s engine was designed by Louis Chevrolet, a famed racecar driver of the era. The Chevrolet motor Company was incorporated. William Durrant, the financial genius to organize General Motors, leased the building on Detroit’s W. Grand Blvd. for the assembly of the new vehicles and 2,999 Chevrolets were produced during the first full year of operation. Chevrolet introduced a valve and head engine an innovation that remains the basic principle of all automotive engines today. Additional assembly plants were opened in the sales operations were expanded. Electric lights became standard equipment on Chevrolet. Chevrolet launched its low price class with the introduction of the “490”. It was named the 490 because of its price $490. Production that year totaled 70,000 units. Production in 1917 125,000 units Chevrolet also introduced the first V-8 engine this year. General Motors was taken over by Alfred P. Sloan Jr., he figured out a price ladder for GM cars. He positioned Cadillac at the top and followed in descending order by Buick, Oldsmobile, Pontiac, and Chevrolet. Chevrolet has 6 assembly plants and 16 regional sales offices throughout the country. Chevrolet adds one-piece windshields with automatic wipers close models. They also featured single plate clutch, 11 inch brakes, and new banjo type rear axles. The new innovations must work because sales topped over half a million (500,000) units in 1925. Chevrolet sales skyrocket and top 1 million outselling Ford for the first time in 1927. Chevrolet continued its innovation and improvement in 1928 a brand-new six-cylinder engine was designed and introduced. Starting in 1929 Chevrolets could purchase in several colors. The Fords still only available in black at this time. Chevrolet induced in the “Knee-Action” suspension and the legendary “Blue Flame” combustion chamber on all of its six cylinder engines. Chevrolet ceased passenger car production, the plants are converted over to help all with the war effort. The Chevrolet plants built antiaircraft guns, shells, and Pratt and Whitney aircraft engines. Chevrolet resumes passenger car production and quickly expands to meet the postwar boom of the GIs returning home. Chevrolet introduces the Bel Air hardtop powered by transmission. Domestic production tops 2 million units for the first time in Chevrolet’s history. The 1953 Corvette is one of the ten most influential vehicles of the last fifty years, according to the influential Consumer Reports magazine. Zora Arkus Duntov becomes head of General Motor’s Corvette Program. He was the father of the Sting Ray. Chevrolet introduces its most influence of engine ever, 265 CI small block and smartly styled 1955 lineup. Dealer introduction of the new line of Chevrolet cars. Model year production of the 1964 Chevelle was 338,286 units which represented 4.3 percent of the total U.S. auto production for the year. The one millionth Corvette is a convertible with an arctic white exterior and red leather interior which duplicated the color scheme of the original 1953 model. The company’s 1997 profits reached $6.7 billion, or $8.62 a share, up from $5.0 billion, or $6.02 a share, in 1996.